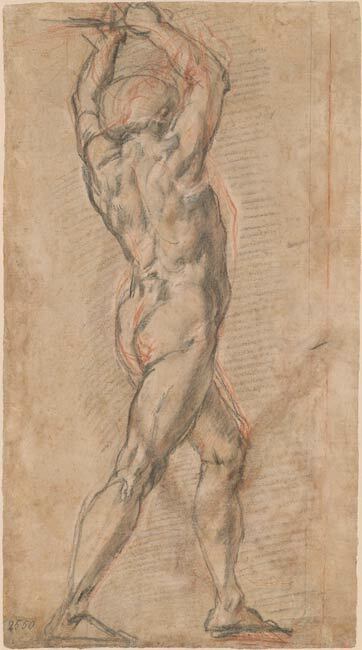 A new exhibition celebrates the Morgan Library & Museum’s extensive collection of Italian Drawings , exploring how the concept of disegno ( a w ord that means both “drawing” and “design ” ) emphasized the artist’s creative power and fundamentally changed Italian Renaissance art. Giovanni Agostino da Lodi (active ca. 1467 - ca. 1524), Head of a Youth Facing Left, ca. 1500, red chalk on paper. The Morgan Library & Museum, 1973.35:2, Gift of János Scholz. Photography by Steven H. Crossot, 2014. Opening February 15, Invention and Design : Early Italian Drawings at the Morgan tells the story of how drawing practice evolved dramatically during the fifteenth and early sixteenth centuries. 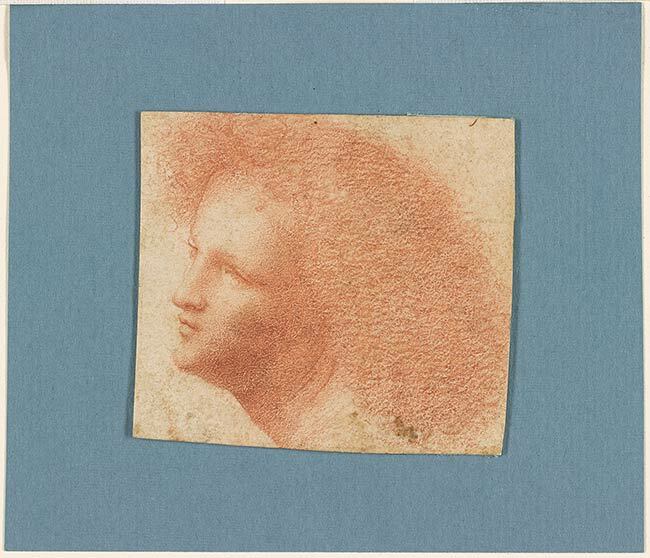 Red chalk with smudging, on laid paper; verso: black and red chalk, traces of white chalk. Inscribed at lower left, in pen and black ink, "Jacopo da Pontormo"; at lower right, in pen and brown ink, A. J. Dezallier d'Argenville inventory number, "334"; on verso, at lower left, in black, "2550"; below this, in pen and brown ink, A. J. Dezallier d'Argenville inventory number, "335 (except for last digit mostly effaced)". This exhibition is the first to focus on the Morgan’s drawings from this extraordinarily fertile period in art history. It features over 90 works by masters such as Mantegna, Filippo and Filippino Lippi, Botticelli, Leonardo da Vinci, Raphael, Correggio, Fra Bartolomeo, and Andrea del Sarto. 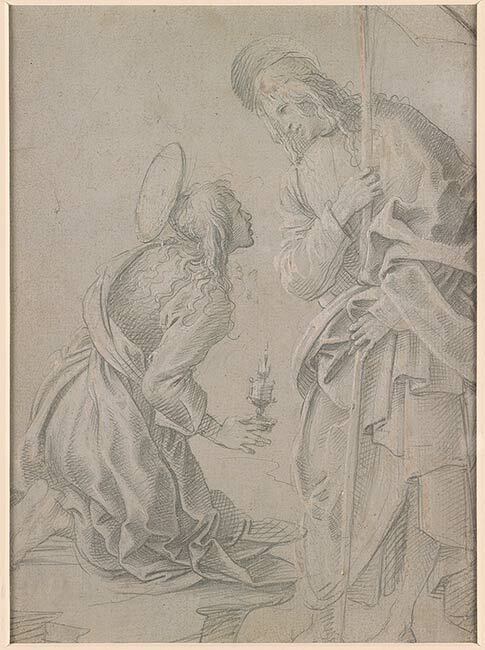 The show is timed to mark an important milestone: the publication of the first catalogue to survey this collection, Italian Renaissance Drawings at the Morgan Library & Museum. Brown and white oil paint ink, with white, over black chalk, on three pieces of prepared linen stitched together. 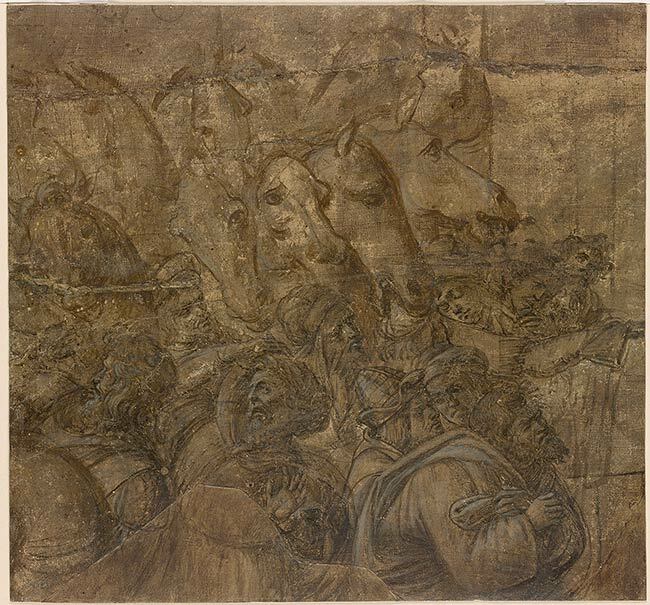 The exhibition is divided into nine sections, some devoted to historical shift s during the development of Renaissance drawing practice, and others to the differences between various regional Italian traditions. From the influence of medieval manuscript and painting workshops to the new practice of sketching, artists gradually moved away from the imitation of standard models to generate novel ways of thinking on the page and represent ng traditional subjects. 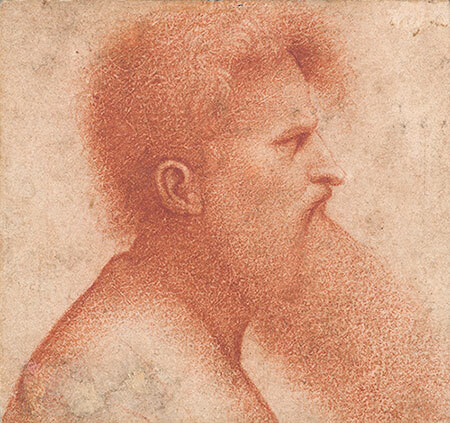 Leadpoint, with white opaque watercolor, on gray prepared paper; verso: leadpoint, with white opaque watercolor, on gray prepared paper; standing man heavily reworked in silverpoint, now turned golden-brown. Purchased with the assistance of the Fellows. In the fifteenth century, portrait drawing emerged as an independent genre, while artists invented new ways approaches to landscape drawing. 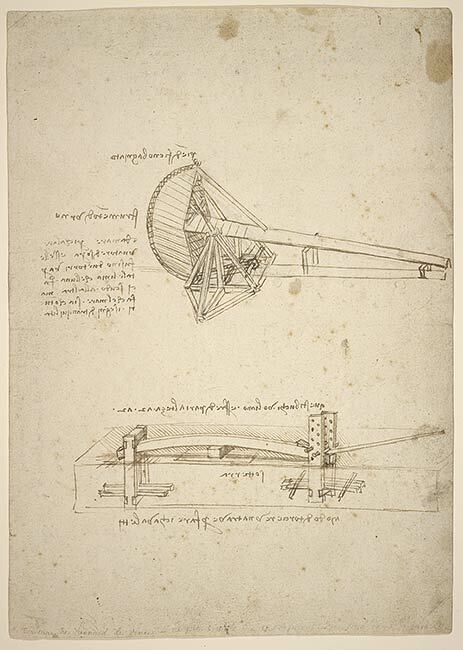 Invention and Design also looks at how the shifts in artistic theory (in the writings of Leon Battista Alberti and others) led artist s away from copying standard models and toward practicing life study, especially in Florence. Artists began embracing both naturalism and invention, under the guidance of masters who believed that the artist well trained in observing and depicting the world would best be able to create his own novel images of it. New and distinct traditions also evolved in regions such as Umbria, Lombardy, Emilia, and Venice. 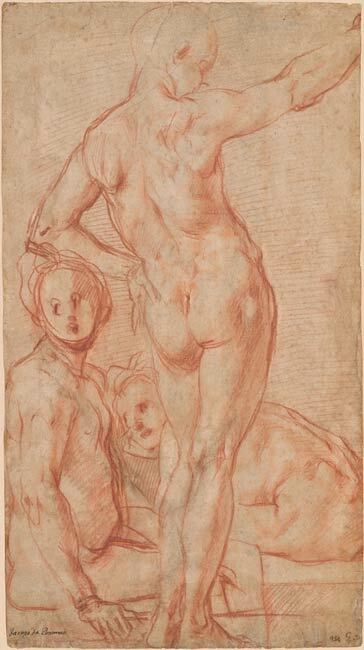 As artists came to be recognized more as intellectuals than as craftsmen, a new class of collectors and connoisseurs created a market for autonomous drawings of classical subjects and other compositions. Pen and brown ink, over black chalk on paper. Italian Renaissance Drawings at the Morgan Library & Museum , by Rhoda Eitel Porter and John Marciari , with Jennifer Tonkovich, and contributions by Marco Simone Bolzoni and Giada Damen, published by the Morgan Library & Museum, 2019. 430 pages. The catalogue presents a selection of 125 drawings by Italian artists born before 1550. It begins with an introductory essay by Rhoda Eitel-Porter on the Role of Drawing in the Renaissance, followed by Jennifer Tonkovich’s essay on the history of the Morgan’s collection of Italian drawings. The drawings are then grouped into a series of nine chapters, each preced ed with an essay by John Marciari that provide a thematic, chronological, or geographic context for the works. Scores of comparative illustrations and extensive notes on provenance, media, condition, and bibliography complement the entries. Marcel Duchamp 100 Questions. 100 Answers.